Nir Kabaretti began this Sunday’s concert with his usual assurance. Facing the wrong way (toward the audience), he gave everyone-orchestra and audience-a signal to rise. We obeyed, and then performed “The Star-Spangled Banner.” The orchestra played enthusiastically and patriotically, and the audience was on key. Together, we found out what a difference it makes to follow the maestro’s inspired conducting. The main program began with William Schuman’s “American Festival Overture,” a bright, jazzy work from 1939 by a composer who is better known for having been president of the Juilliard School and, later, the Lincoln Center during some of its most revolutionary years. This short work is no less visionary-it’s brash and bold, with quirky motifs and odd juxtapositions, all encompassed by a sense of energy and play. 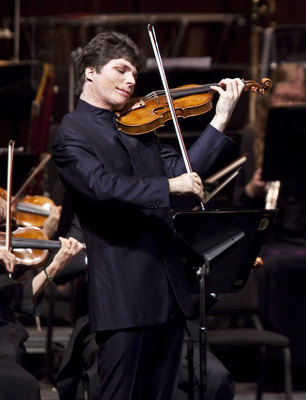 Augustin Hadelich applied consummate musicianship and his 1683 ex-Gingold Stradivari violin to works by Mozart and Paganini. None of the energy had dissipated when a smaller version of the orchestra and violinist Augustin Hadelich returned to play Mozart’s Violin Concerto No. 5 in A Major (K. 219), a familiar and moving work from Mozart’s teenage years in the service of the Prince Archbishop of Salzburg. The work has everything that came so naturally to Mozart-gracefully balanced phrases, sweet, delicate melodies, and humor-and playing it clearly comes naturally to Hadelich, whose nuanced interpretation of the work suited the orchestra and the hall perfectly. The final movement contains a “Turkish” melody that yields a solid, boisterous finish to what might have been too refined a concerto, and Hagelich’s marvelous range showed us how bold Mozart was in writing it. After a standing ovation, Hadelich was kind enough to give us an encore, Paganini’s Caprice No. 17, an extraordinarily difficult piece that he handled easily. After the intermission came the thunder-Tchaikovsky’s Symphony No. 5 in E Minor, Op. 64, a work filled with the voice of fate or the sound of Cossack horses’ hooves, depending on whom you believe. Here, Maestro Kabaretti brought us something clearer and yet more complex than one usually encounters in performances of Tchaikovsky’s symphonic works. Instead of the usual fireworks, we heard huge forces at work, at times in conflict, at others at peace, but always governed by the power of an intelligent mind. When the music stopped, the audience gave out an astonished “Oooh!” They got it!